The Conference tilted Engaging for Holistic Development organized by the Sevalanka Foundation was held under the patronage of President Maithripala Sirisena at the Sri Lanka Foundation Institute on January 22. At this conference, the special attention was drawn to find solutions for the major issues of social and environmental faced by the modern world through the Buddhist philosophy. Participants stated that one of the best solutions for the issues we faced today is to live a simple life understanding the Buddhist philosophy. Further at this conference it was pointed out that the ancient Asian people considered the environment to be a major blessing, not a threat. Ven. 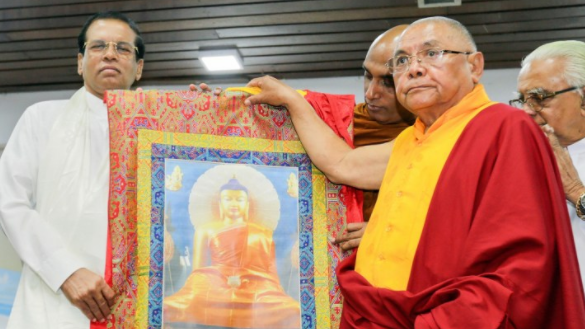 Lama Lobsang, Director-general of the International Buddhist Confederation of India presented a portrait of Lord Buddha and a replica of Bodh Gaya to the President. The Maha Sangha representing 30 countries, Ven. Lama Lobsang, Ven. Athuraliye Rathana Thero, Dr. A.T. Ariyaratne and others participated in this conference.